Bollywood actor Shah Rukh Khan's son AbRam's dream of meeting his favourite cartoon character Chhota Bheem came true when a life-sized soft toy of the fictional superhero greeted him at his residence. 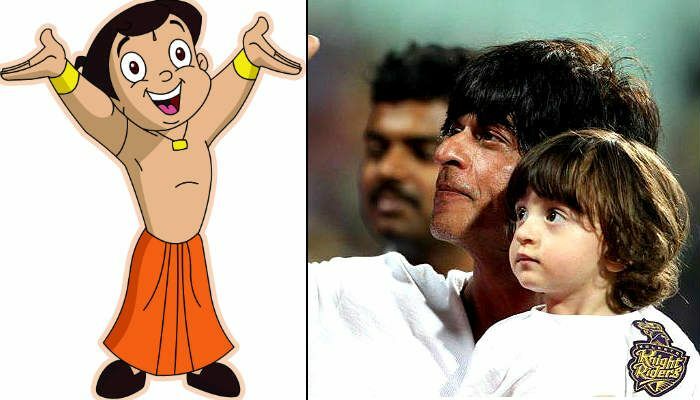 Shah Rukh had earlier shared on Twitter that the two-year-old likes to watch "Chhota Bheem and Mowgli." After getting to know about it, Rajiv Chilaka, CEO of Green Gold Animation, who is the creator of Chhota Bheem and has directed the forthcoming film Chhota Bheem - Himalayan Adventure, decided to send his star character to Mannat a few days ago. "In 2014, when we met Kajol she really appreciated our content because it is clean and parents find it comfortable when their kids are watching Chhota Bheem. Shah Rukh also said his child loves Chhota Bheem. I felt really humbled that our hard work has paid off," Chilaka said in a statement. "Animation is a very difficult market because we compete with international content directly. They have more muscle power so to keep afloat with anything Indian is a huge challenge," he added. Chhota Bheem - Himalayan Adventure will release on 8 January, 2016. Pathankot attacks the latest in a series of low-intensity terror incidents, what is going on? READ NEXT >> Pathankot attacks the latest in a series of low-intensity terror incidents, what is going on?